Since we are now safely passed the mid-November mark, it's an acceptable time for a Christmas post! As a kid, one of the staple Christmas traditions in our house was the advent calendar. Chocolate every day, before lunchtime! What a friggin' treat. This year I decided that I wanted to bring back the advent calendar … Continue reading DIY Christmas Advent Calendar! Hey folks, how’s it hanging? Do me a wee favour and have a look around you right now. Where are you? Bedroom? Office? Bathroom (because you’re reading this while on the toilet (no judge))? Take a moment to notice the things that surround you. Start with the big stuff then work down: House, room, couches, … Continue reading Reducio! 2016 – Make It Green! 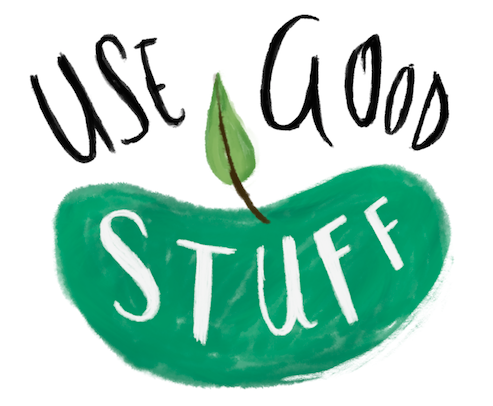 Hello everybody and welcome back to Use Good Stuff for 2016! The new year is when a lot of us start setting new goals - whether we stick to them or not, the intentions are good! If you still have room on your list for a few more resolutions, how about adding in some new … Continue reading 2016 – Make It Green!